Here’s what the Twitter Profile of disgraced former USC coach Lane Kiffin can tell us about Lane Kiffin. Either he’s living in the past or he’s a liar. I tend to think he’s a liar. An honest bro deosn’t say “Head football coach at USC,” when he’s not the head football coach at USC? Who does that? Seriously. Lane Kiffin does. 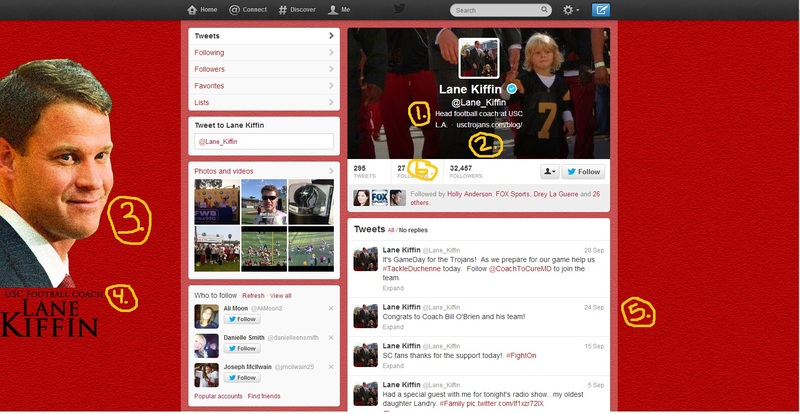 If you had doubts about who Lane Kiffin claims to be you could click the link to his website: usctrojans.com/blog/. On that very site you will be directed to this article. That article explains that Ed Orgeron is now the interim head coach of USC. The article posted immediately before that one is titled, “Kiffin Terminated.” So yeah, he’s lying. I’m not sure if Lane thought “that’s the best picture of my good side I’ve seen in years” or what, but who uses a blurry background photo. This looks like it was scanned out of a newspaper (remember those?) and then cut out and laid on top of a piece of felt. What a joke. Oh and also, LANE IS NOT THE USC FOOTBALL COACH. Liar. Kiffin expresses congratulations to Bill O’Brien and his Penn State team. For a win? Nope. For having some NCAA scholarship restrictions lifted. So yeah, Lane just congratulated a coach for good behavior in NCAA prison. To be clear: I think O’Brien has done a great job. But I’m not claiming to be the head coach of USC. Some dude name JK McKay who has no profile picture and hasn’t tweeted in 18 months. A bro named Dan Stimmler whse profile is private. Lane, consider this my formal application to be your 28th followee. THAT was a weekend for the books. Early estimates put me at 3 near heart attacks (UGA/LSU, last Falcons drive, Breaking Bad), two transcendent works achieving greatness, and one eerily familiar pit in my stomach as the result of a football play in a certain end zone in a certain Dome. That said, enough can’t be said about the performance both teams between the hedges on Saturday, but someone had to win, and I sure am glad it was the home team. I’m still a little spent from everything that happened this weekend, so bear with me, as I’m sure the good, the bad and the ugly will bleed heavily into each other. Like an M-60 on a clay pigeon launcher. – Holy quarterback duel Batman! Cam Cameron’s effect on Zach Mettenberger has been celebrated here repeatedly, but I was in absolute awe as he called a near perfect game on the offensive end for LSU. Much will be made of the Georgia defense’s inability to stop the Tiger passing attack, but trust me when I say that when that playbook is wide-open, there aren’t a whole lot of schools in the country that can stop them. There’s something to be said about an NFL coordinator employing NFL concepts against college kids, but the only word that comes to mind is unfair. Mettenberger was anything but shook in Athens on Saturday, and did everything that his team needed for them to win. – AARON FREAKING MURRAY!!! Overcoming another early pick (damn you, zone blitz! ), he carried this team through consistent adversity to secure the win. Passing for 4 touchdowns, running for one more, and just named the SEC Offensive Player of the Week, I think it’s safe to say that he can indeed win ‘the big game’. The lack of big play receiver both flew in the face of my portents of doom and gloom and almost felt answered, after Chris Conley tallied 5 catches of 112 yards and a touchdown in the win. Above all else, Murray was masterful when he needed to be, especially as outlined by the EIC here in the final, deciding drive. – The O-line play. My god. That front for LSU was labeled world beaters coming in, and for damn good reason. But a veteran offensive line did exactly what they were supposed to do in a big game: continue to grow as a unit and protect the quarterback. The pocket was serene for most of the 4 man rushes, pressure only coming when LSU had to dial-up their blitz package. Even then, the pressure was often ineffective and taken advantage of by the know-how of a veteran unit. – KEEF Marshall. Welcome back. Running mostly out of shotgun sets, he did a great job of stepping up after Gurley was sidelined. His ability in space in the passing game, and his ability to run helped accentuate that dominant passing game. He spearheaded a running attack that generated 196 yards on 36 carries, and kept the LSU defense off-balance, and less likely to rush hard up field, for fear of getting beat by screens and draws. – Defense came to play in a big way. One of our biggest points in our LSU preview was the ability of the Tigers to play two-handed, and Grantham and company worked mightily to take away one of those hands, and while LSU’s dedication to the run matched Georgia’s, their 36 runs netted only 77 yards, far and away below their season average. 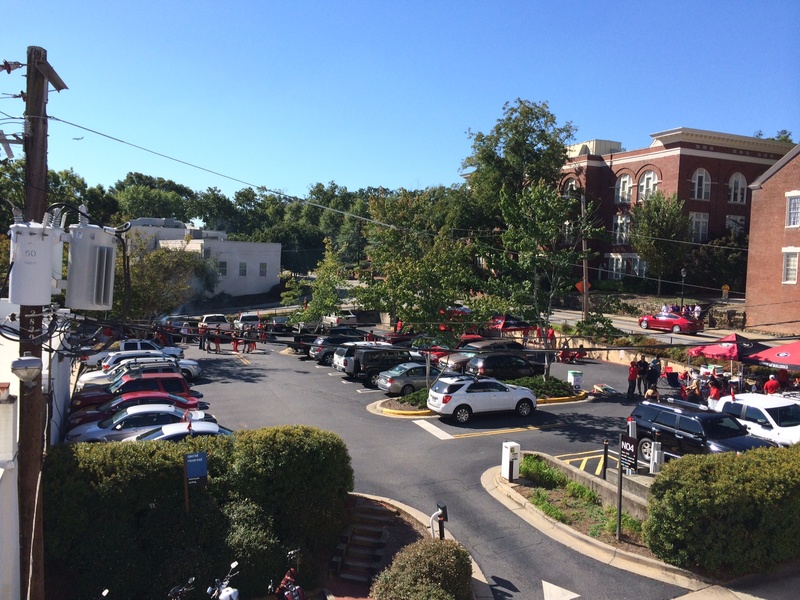 The front for UGA and the backers harassed Mettenberger all day, and the last drive was a perfect picture of both Georgia’s resiliency and Mettenberger’s need to improve against pressure. – LAST ONE I PROMISE. 55 bleeping yards. – Todd Gurley left the game after suffering an ankle injury (listed day-to-day) but not before piling up 73 yards rushing on only 8 carries. While it was impressive to get this win without him, I’ll take him getting healthy sooner than later, if it’s all the same to you. – The secondary got picked on again, but this time it wasn’t by a mobile quarterback altering calls with his legs, it was with a dominant quarterback under center with extreme control over his offense. The secondary breakdowns continue, and I hope these games don’t keep coming down to who needs the stop late, because that’s not a place I feel comfortable with this secondary quite yet. – That September schedule. WOOF. Three games against top 10 opposition before October 1st, and coming out 3-1? That’s an amazing feat, and if UGA can take care of business going forward, this will be a fun year for the Dawg faithful. There. I did it. I tore myself away from Breaking Bad finale analysis long enough to re-watch and break down the best college football game of the year so far. Up next is Tennessee, a dangerous team fighting with it’s back against the wall. But, I have faith in this veteran group that has already rallied this team through the early season to not overlook the Vols, to go to Knoxville and to handle business. In true DudeYouCrazy fashion, we followed up one of the biggest wins in recent Georgia history with a day of complete radio silence yesterday. And I’m perfectly fine with that. If you watched the game – either in person or at home – and saw the display on the field and the emotional celebration that followed, you would have only been disappointed with anything that we could have added. But now that everyone is rested and recovered, we will be doing some analysis, and this should be a really fun week on DudeYouCrazy. For those who think LSU fans smell like corndogs, you might or might not be right. 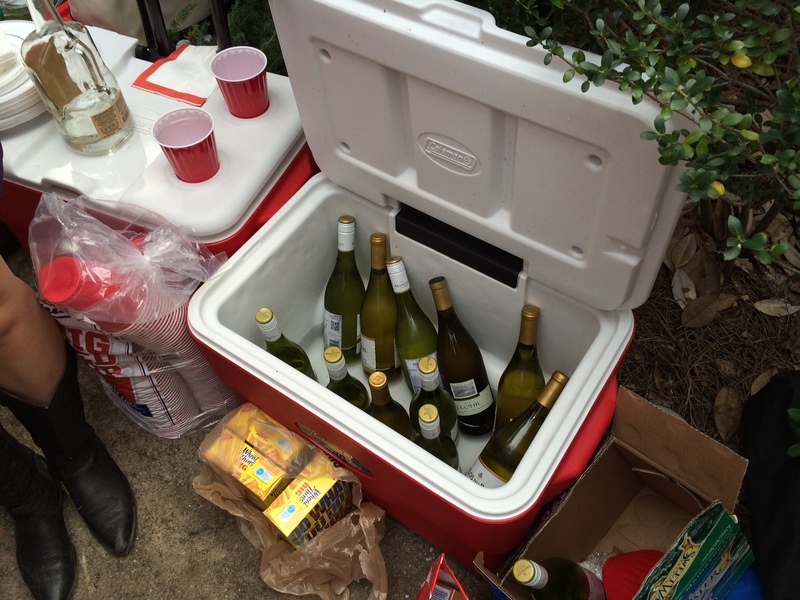 But, we did find one classy Tiger tailgate with a cooler full of wine. This was the best game I can remember attending in Sanford Stadium. I hesitate to call it the “best I’ve ever seen,” because I can’t stop thinking about this game and such a narrow focus is surely causing me to forget another classic or two. Chad the Intern played the role of gracious host at Roofgate – a tailgate on a roof. This was the view. Every part of the game was enjoyable. The weather was incredible; the crowd was early and loud. Men’s basketball coach Mark Fox was painted like a freak. Bubba Watson was in the house. Outside of the crowd itself, I don’t know how much any of those factors affected what happened on the field, but little things like sunlight and rolling breezes go a long way in adding to the value. Obviously, the crowd was a factor. For the second time this season (the first being South Carolina), it felt like Sanford Stadium was a bona fide hostile environment. If you’re looking for the impact of the crowd, look no further than LSU’s timeout usage. Five of the six timeouts called by the Tigers came with their offense on the field. One was to set up a field goal, one was to stop the clock late in the game. One was followed by a false start penalty on 2nd and 10. The other two came on third and long scenarios. After Georgia marched the field on its opening possession I told my buddy Cory that LSU might have lost the game by deferring after winning the coin toss. Had LSU gone on a similar march to open the game, the crowd might have lost its luster. Instead, an eight play, 75 yard drive in just over 3 minutes served as an appetizer a ravenous contingent in Sanford Stadium. The crowd showed up. Hard. Lost in the carnage of this shootout is just how good both of these teams are, especially on offense. When two SEC teams combine for 85 points, it’s easy to assume that everything went right for both offenses. That wasn’t the case. Georgia lost a turnover on a tipped ball early in the game, and the Bulldogs’ best player (Todd Gurley) was lost early in the second quarter. At that point Gurley had already accounted for 73 yards on just eight carries. It seems foolish to do so, but I like things like this: Extrapolate his performance over the game’s first 19 minutes and he could have finished with 230 yards rushing on 25 carries. Woof! Losing Gurley hurt Georgia more than anyone would like to admit, and the Bulldogs still put up 45 points thanks to strong running by Keith Marshall (20 carries for 96 yards) and JJ Green (one clutch carry for 18 yards) and a balanced passing attack. LSU has its fair share of obstacles as well. The Tigers were held to 77 yards rushing on 36 carries. Mettenberer spent a large portion of his day on his back. Glory glory to ole meeeeee. This game was the anti-North Texas as far as Georgia Special Teams was concerned. LSU’s Odell Beckham accounted for 175 kickoff return yards, which sounds absolutely ludicrous. But on seven chances, a 25 yard average is quite manageable and below his season average. Georgia punted just twice. No return yards were yielded and one punt was fumbled by Beckham and recovered by Georgia. Marshall Morgan was perfect on extra points, but more importantly he was 3/3 on field goals from 24, 38 and 55 yards out! Georgia absolutely dominated the line of scrimmage on both sides of the ball. Aaron Murray was not sacked, and LSU managed just two tackles for loss for a total result of four yards lost. Hell of an effort by Georgia’s offensive line. On the other side, Mettenberger was sacked four times for a combined loss of 26 yards. Georgia managed seven tackles for loss. And, the running yards tell this line of scrimmage story quite nicely. LSU: 36 carries for 77 yards. Georgia: 36 carries for 196 yards. Full disclosure: I realize that Mettenberger played a great game. But he’s not my quarterback. Murray pass complete to Justin Scott-Wesley for 11 Yards. Aaron Murray pass complete to Arthur Lynch for 9 yards. Keith Marshall run for 2 yards. Aaron Murray pass complete to Arthur Lynch for 10 yards. JJ Green run for 18 yards. Aaron Murray pass to Justin Scott-Wesley for 25 yard Touchdown. Marshall and Green both ran for huge first downs. Murray was 4/4 for 55 yards and a touchdown. But he can’t win the big one. This was a huge win for Georgia. No way around that. Let’s hope the Dawgs can stay sharp and the defense can improve over the coming weeks. As always, Florida will be a challenge, but overlooking Tennessee, Missouri or Vanderbilt could be costly. Here are some thoughts we published previously on the LSU Tigers. Enjoy and get ready. Chad the intern (@Chad_Floyd) and Andrew Hall (@DudeYouCrazy) will be bringing live coverage from Athens starting around 9 a.m. via the Tweeting Mechanism. So follow along. Also, follow this guy for a good laugh. I don’t really know how good the LSU Tigers were in 2012. I thought I had them pegged at the season’s midpoint – they were a bipolar squad (a la Georgia) that could play with the best or the worst on any given day. They pushed Alabama to the brink before falling short 21-17. But, they beat Auburn by the abysmal score of 12-10. My gut tells me that LSU’s offense struggles (against just about everybody) and that a young Georgia defense playing in its fourth overall game and third game against a top-15 opponent will be able to hold its own. My gut says that the loss of two running backs (Spencer Ware and Michael Ford) and four offensive linemen to the NFL Draft is going to put a lot of pressure on Zach Mettenberger. And, my gut tells me that Georgia’s seasoned offense is going to take advantage of a defense that is missing eight starters from 2012. This game is going to come down to Zach Mettenberger’s ability to “take the next step.” It may be that simple. The whole Murray vs. Mettenberger storyling is already making me nauseous. I’m tired of hearing about it. LSU has established its reputation as a big, mean, fast, physical team in the Nick Saban and Les Miles eras. With powerful backs Jeremy Hill, Alfred Blue, and Kenny Hilliard running at a young Georgia defense, it is critical that the three calendar weeks between South Carolina and LSU (bye, UNT, practice) be used to find 8-10 capable bodies to neutralize the running attack. Barring an 0-2 Georgia start, this will be the 3:30 CBS game that day, and staying fresh into the 4th quarter is critical. I’m not going to rehash 2011 SEC Championship memories on this column after causing PTSD with the S.C. breakdown, but LSU is always strong in special teams. While there is no established Patrick Peterson or Tyrann Mathieu returning kicks for the Tigers yet, it does not mean one will not emerge. Also, Les Miles is not afraid to allow special teams to determine the outcome of the game. Punter Brad Wing (the only punter I’ve ever known to declare for the NFL early) is gone, but you can count on at least one crazy fake field goal or punt on this big stage. If you’re not familiar with Wing, he’s in some ways punting’s equivalent to Sebastian Janikowski. Strong leg, trouble child, suspended for a bowl game, and famously scoring a 52-yard touchdown against Florida that was called back for excessive celebration. While modern-day LSU is characterized by the Mad Hatter being the luckiest man in sports, I think there is something to be said in the theory that preparation can create luck. Expecting the unexpected against the Tigers is a must. If the game is within 10 points in the final 7-10 minutes, there is really no telling what could happen. QB Zach Mettenberger is famously (more likely infamously) making his return to Sanford Stadium, and adding to the intrigue is the fact that he’ll likely want to make his presence known to Bulldog fans. While an overly-hyped Mettenberger could be a blessing for the Dawgs, the combination of him and Les Miles’ uncanny ability to pull wins from where the sun don’t shine would make for a very nervous crowd of 92,000 in the closing minutes of this game. I opened this preview series with Alabama for no other reason than my own lack of creativity and my over-reliance on alphabetic order. But, if I had started with the best team in the SEC, I also would have started with the Tide. And, if that was the case and the window I was examining was the past four years, LSU would have been second on the list. Alabama has won two consecutive National Championships. Alabama has won three of the last four National Championships. Alabama has lost just five games over the last four years. Two of those losses came to LSU. In the past four years, Alabama has a .600 winning percentage against the Tigers and a .939 winning percentage against the rest of the world. LSU has won two of its last three regular season matchups with the Tide. With the exception of the National Championship Game in January of 2012 (a game that found LSU in the middle of a lockerroom power struggle), none of these matchups has been decided by more than nine points. The last four regular season battles have been split and Alabama holds an overall scoring edge of just 72-65. LSU lost a lot on the defensive side of the ball. I talked at length about that here. But, unlike other schools (Georgia for instance), LSU reloads its defense. There is no rebuilding. I have no doubt that LSU’s defense will reload despite losing seven big contributors from a year ago. LSU once again faces a brutal schedule. The Tigers do as well as anybody when scheduling out-of-conference games, and this year they open with TCU in Dallas. They draw Florida and Georgia (two of the East’s three best teams) and have to travel to Alabama. That’s no easy group, but those games are spread out quite nicely. TCU comes on August 31st at Cowboy Stadium. Four weeks later the Tigers come to Athens, GA. Two weeks later, the Gators come to Baton Rouge. Four weeks later LSU plays at Alabama. Two weeks later Texas A&M comes to the Bayou. Depending on the outcome of the Georgia game, LSU wins either 10 or 11 games. LSU has yet to be challenged in opening 4-0, and no the final score against Auburn (35-21) does not tell the story of the (LSU) Tigers manhandling Auburn and going into cruise control once up 3 TD’s. This is the strongest opponent Georgia will face all year, even with a defense with no established stars yet. The keys for Georgia are threefold: 1) keep the LSU offense off schedule on 1st and 2nd down, where run accounts for 73% of their plays. On third and long, Mettenberger isn’t a threat to scramble for many first downs, so doubling the two wideouts and perhaps bringing a number of disguised blitzes from all over the place (and using the speed of the defense against big, slow linemen) is the best way to get off the field. I trust Todd Grantham to have some interesting looks dialed up. This brings up 2) make Zach Mettenberger uncomfortable. This is the same guy who looked downright awful for 2/3 of the season last year, and he will be playing a homecoming game with a (WILL BE OVERUSED AS A STORYLINE CLICHE ALERT) chip on his shoulder, wanting to make Georgia regret letting him go. Using his adrenaline and aggressiveness to its advantage, Georgia could hope for some overthrows and forces if it can rattle the ‘stache early. 3) Unfortunately, LSU WILL stay on schedule with the run more often than not. In third and short, LSU is at its most dangerous. Hill is a one-cut terror who can run over or around DB’s, and is a threat to go the distance against a stacked box if players don’t win their individual battles or maintain gap discipline. The Tigers also employ a one-step quick slant to both Landry and Beckham against man, and it’s almost impossible to stop. In these situations, pressing at the line and playing the safeties deep in case something goes wrong is the best bet. We know the strength of Georgia’s offense at this point, and that is balance. Aaron Murray is throwing for a ludicrous 12.6 yards per ATTEMPT thus far this season, and I’ll disagree with colleague Daniel Palmer’s evaluation that a lack of a true #1 receiver hurts the Bulldogs. JSW, Chris Conley, Michael Bennett, and Arthur Lynch can all become de-facto #1′s based on what the defense is giving them, and I expect Murray to find out who that is early on and make him an integral part of the passing attack early. Personnel-wise, much has been made about LSU’s loss of 11 guys to the NFL draft on defense. However, they still boast the best pair of tackles in the league (Ego Ferguson and Anthony Johnson), so running between the tackles may not be as viable an option as it has been the first month of the season. I think I speak for all of us when I say I want to see Keith Marshall employed outside the tackles, and this could be the week he gets loose (or so I hope after 3 games of banging heads against a wall with him between the tackles). The Tigers also possess two headhunters at safety (Craig Loston at 6’2 209 and Ronald Martin at 6’1 219). Loston is good enough in coverage to be a problem, but isolating Martin 1-on-1 may prove fruitful for the Dawgs. I’m not worried about Georgia having success on offense, as this should go down as LSU’s worst defensive performance of the season. As long as we don’t get too cute with the playcalling and substitutions (looking your way, offensive line) enough points to win the game will be available. Barring any egregious, game-changing mistakes by Georgia’s special teams (NOTE: we’re not due for any until about 2017), I think Georgia wins on the strength of an underappreciatedly-historically-good offense and a raucous capacity crowd. 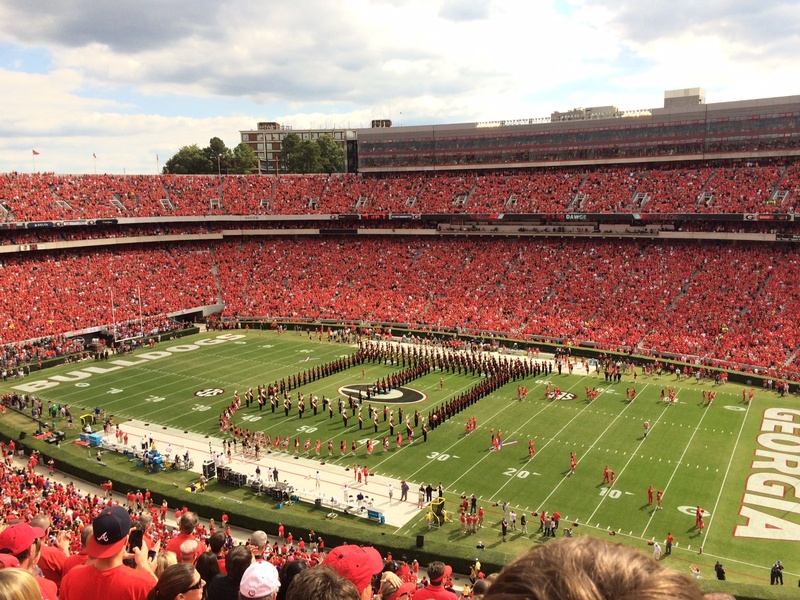 Let’s call it Georgia 30, LSU 24, and about 19 hours of fun in Athens on Saturday. Vanderbilt has two wins this season…. both of which have come from what people would call pancake teams. Vanderbilt has another one of those games today when they face off against UAB in Nashville. As I would expect, Vanderbilt will hope to continue to over-utilize Jordan Matthews and continue to establish the running game that has came alive over the past couple of weeks from Tate and Seymour. Here is the only problem I have with this game….. If you ask me, let this UAB game be a statement game. I would love nothing more than for Vanderbilt to come out against UAB and “punch in them in the mouth”. Vanderbilt hasn’t opened up a game quickly and that is what I would really like to see against the Blazers. And keep the starters in…. I know that a beating of a weaker team doesn’t look impressive on paper but if Vanderbilt can show Georgia that they have more weapons then just Jordan Matthews it might help them believe they can win this game next week.